We’ve been eating out fairly often this month due to a combination of crazy schedules and sheer lazy on my part.Â The Lazy doesn’t extend to letting The Boy off the hook, however, and each meal involves some hearty negotiation over the contents of his plate. We popped by a local Japanese restaurant that is very family-friendly and pulled up to the table for a little adventure.Â The Boy is often pretty (surprisingly) reliable with Asian flavors, unlike his mom (I know, I know) who has issues with a few popular flavors in Asian meals. 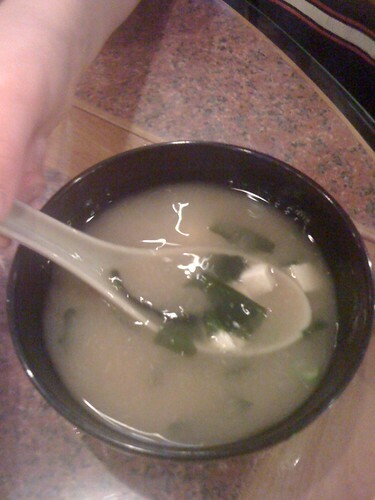 So, naturally they brought me a lovely, steaming bowl of miso soup, I thwapped it onto the lazy susan and sent it over to The Boy.Â He calmly pulled it off the lazy susan and tucked in. Seriously, even with me over on my side of the table making hairball noises about it, he slurped up the juicy seaweed and ate the tofu. 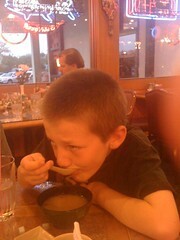 He loved the broth, too. I don’t even know where this kid came from anymore. But at least I have a new miso soup buddy to hand off to. Run in 28 queries. 0.412 seconds.